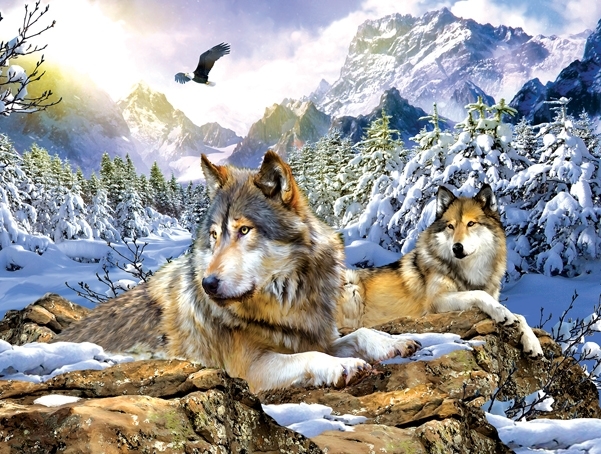 The Wolves on the Snow Wolf Puzzle remind me of two of our Wolves in their younger days, Wa-ta-chee and Ohoyo. The rocky ledge that they are sitting on is similar to their stone den. The only difference is the Wolves in this puzzle are surrounded by moutains and there is an eagle flying in the sky above them. This Wolf puzzle is 100% made in the USA using eco-friendly, soy-based inks on recycled board. They puzzle comes nicely boxed with a picture of the puzzle on the cover. Perfect for gift giving.